City in the government of Piotrkow, Russian Poland, about 90 miles west of Warsaw. As late as 1821 it was only a village of 800 inhabitants, when the manufacture of woolens was first introduced there by Germans Later, cotton-mills were added. The population of Lodz gradually increased until in 1872 it amounted to 50,500; and in 1876 it reached a total of nearly 80,000, including about 15,000 Jews. Lodz is now considered the second city of Poland, both in population and in the importance of its cotton-mills; indeed, it is styled "the Manchester of Poland. "The rapid growth of the city is due no more to the Germans than to the Jews, who introduced numerous spindles and hand-looms in almost every household, and, being satisfied with small profits, were able to compete with the largest manufacturers both in Moscow and in other cities of Russia. The expulsion of the Jews from Moscow in 1891 helped to increase the volume of business in Lodz. 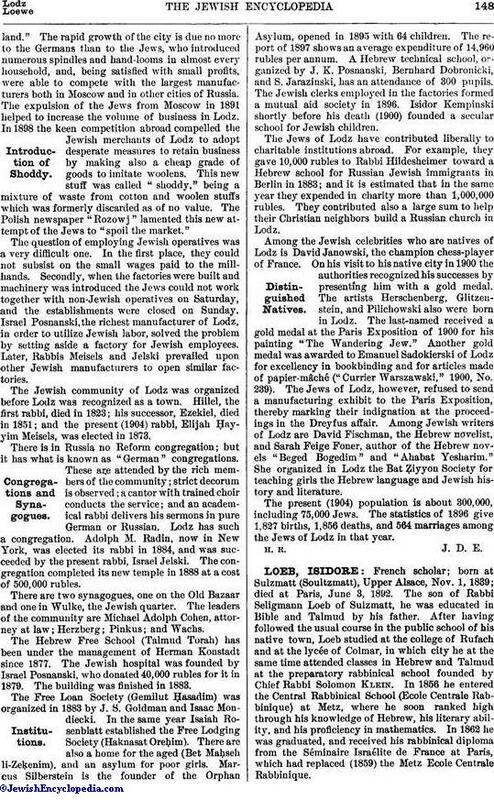 In 1898 the keen competition abroad compelled the Jewish merchants of Lodz to adopt desperate measures to retain business by making also a cheap grade of goods to imitate woolens. This new stuff was called "shoddy," being a mixture of waste from cotton and woolen stuffs which was formerly discarded as of no value. The Polish newspaper "Rozowj" lamented this new attempt of the Jews to "spoil the market." The question of employing Jewish operatives was a very difficult one. In the first place, they could not subsist on the small wages paid to the millhands. Secondly, when the factories were built and machinery was introduced the Jews could not work together with non-Jewish operatives on Saturday, and the establishments were closed on Sunday. Israel Posnanski, the richest manufacturer of Lodz, in order to utilize Jewish labor, solved the problem by setting aside a factory for Jewish employees. Later, Rabbis Meisels and Jelski prevailed upon other Jewish manufacturers to open similar factories. The Jewish community of Lodz was organized before Lodz was recognized as a town. Hillel, the first rabbi, died in 1823; his successor, Ezekiel, died in 1851; and the present (1904) rabbi, Elijah Ḥayyim Meisels, was elected in 1873. There is in Russia no Reform congregation; but it has what is known as "German" congregations. These are attended by the rich members of the community; strict decorum is observed; a cantor with trained choir conducts the service; and an academical rabbi delivers his sermons in pure German or Russian. Lodz has such a congregation. Adolph M. Radin, now in New York, was elected its rabbi in 1884, and was succeeded by the present rabbi, Israel Jelski. The congregation completed its new temple in 1888 at a cost of 500,000 rubles. There are two synagogues, one on the Old Bazaar and one in Wulke, the Jewish quarter. The leaders of the community are Michael Adolph Cohen, attorney at law; Herzberg; Pinkus; and Wachs. The Hebrew Free School (Talmud Torah) has been under the management of Herman Konstadt since 1877. The Jewish hospital was founded by Israel Posnanski, who donated 40,000 rubles for it in 1879. The building was finished in 1883. The Free Loan Society (Gemilut Ḥasadim) was organized in 1883 by J. S. Goldman and Isaac Mondiecki. In the same year Isaiah Rosenblatt established the Free Lodging Society (Haknasat Oreḥim). There are also a home for the aged (Bet Maḥseh li-Zeḳenim), and an asylum for poor girls. Marcus Silberstein is the founder of the Orphan Asylum, opened in 1895 with 64 children. The report of 1897 shows an average expenditure of 14,960 rubles per annum. A Hebrew technical school, organized by J. K. Posnanski, Bernhard Dobronicki, and S. Jarazinski, has an attendance of 300 pupils. The Jewish clerks employed in the factories formed a mutual aid society in 1896. Isidor Kempinski shortly before his death (1900) founded a secular school for Jewish children. The Jews of Lodz have contributed liberally to charitable institutions abroad. For example, they gave 10,000 rubles to Rabbi Hildesheimer toward a Hebrew school for Russian Jewish immigrants in Berlin in 1883; and it is estimated that in the same year they expended in charity more than 1,000,000 rubles. They contributed also a large sum to help their Christian neighbors build a Russian church in Lodz. Among the Jewish celebrities who are natives of Lodz is David Janowski, the champion chess-player of France. On his visit to his native city in 1900 the authorities recognized his successes by presenting him with a gold medal. The artists Herschenberg, Glitzenstein, and Pilichowski also were born in Lodz. The last-named received a gold medal at the Paris Exposition of 1900 for his painting "The Wandering Jew." Another gold medal was awarded to Emanuel Sadokierski of Lodz for excellency in bookbinding and for articles made of papier-mâché ("Currier Warszawski," 1900, No. 239). The Jews of Lodz, however, refused to send a manufacturing exhibit to the Paris Exposition, thereby marking their indignation at the proceedings in the Dreyfus affair. Among Jewish writers of Lodz are David Fischman, the Hebrew novelist, and Sarah Feige Foner, author of the Hebrew novels "Beged Bogedim" and "Ahabat Yesharim." She organized in Lodz the Bat Ẓiyyon Society for teaching girls the Hebrew language and Jewish history and literature. 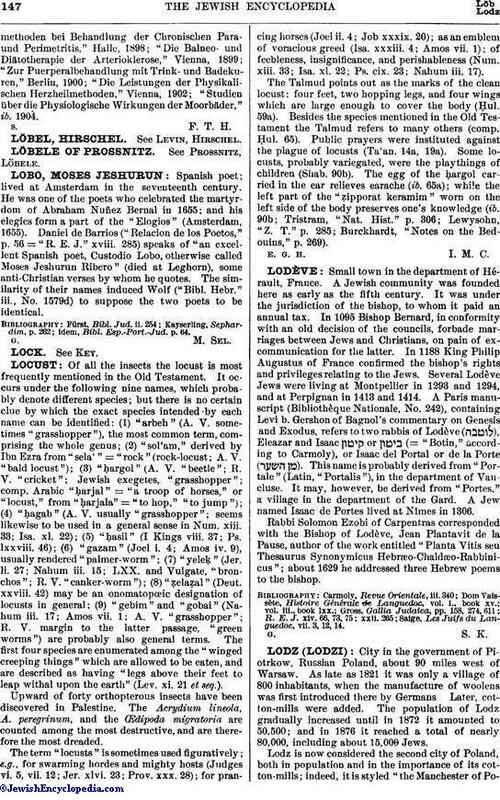 The present (1904) population is about 300,000, including 75,000 Jews. The statistics of 1896 give 1,827 births, 1,856 deaths, and 564 marriages among the Jews of Lodz in that year.